It's not as hard as it sounds. And honestly, it all started when the VP of this company (let's call it Tech Co) backed into my car in a parking lot. Okay, maybe it started before then, but that was the first time I actually admitted out loud that I had made a big mistake by accepting a "dream job" in Silicon Valley for a global technology company during the fall of my senior year. Long story short, in February a visitor at UGA backed into my car in the parking lot and during this encounter he asked for my plans after graduation. I randomly admitted that I had a job I honestly didn't want and I felt stuck. 5 minutes later I find out he is the VP of Marketing for Tech Co. - so my future bosses' bosses' boss. My expression exactly when I figured that out. Needless to say, he told me he'd help find a position I really wanted and he wouldn't tell anyone as long as I contacted HR soon. So, after 2 weeks of drafting emails and phone call conversation points, I told Tech Co. that the position was no longer for me. This came after months of realizing that I took this job because I was scared - of graduating, of leaving my friends, and above all, I was scared of uncertainty and what others would think of me. Everyone told me that this was the opportunity of a lifetime; everyone else thought it was the greatest position; everyone else thought (fill in every blank)...but me. My entire life I have pushed myself out of my comfort zone. I went to college 2,000 miles away from home. I joined countless clubs and at one point I had three jobs and was taking 17 hours of classes. Yet, some part of me knew this job wasn't for me and I'm so happy I didn't go. Today would have been my first day, and instead of moving to California alone without friends or family, I'm living happily in NYC surrounded by friends and loved ones with a job I love. You're fully in charge of your future. A truth I didn't realize until it literally hit me (and my car) in face. So in June Frank and I packed up our bags and moved to NYC - with 4 suitcases and 6 boxes. Trust me, I wasn't Miss Happy-Go-Lucky during this time. I was scared and confused and worried for every possible situation. But I contacted a few people and luckily got the most amazing job for a creative agency in the Lower East Side. Our perfect little kitchen nook. 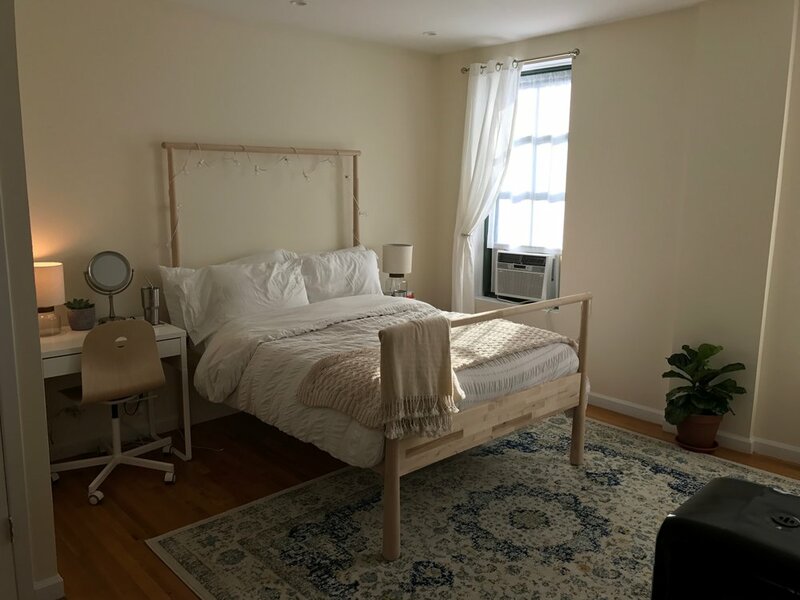 With the help of our wonderful families, we were able to find a cute little apartment in the Upper East Side and get everything set up perfectly. NYC has been challenging and beautiful and full of surprises, but it's everything I've ever dreamed of - a place to grow and learn and explore. Yes, I'm making less money than I would have in California, but YES, I am so much happier living the life I really wanted. Salary doesn't equal happiness. So, if you're reading this and contemplating a decision to push yourself further, to move to the strange city without a job, to take the job you really want and not the one you think is the "better choice", go for it. You're in control of your happiness. Own it.